Harvey has a new home! 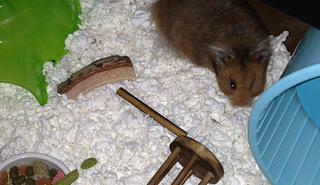 | Loving Spirit Hamster Rescue, Inc. Thinking of surrendering an animal? Harvey has a new home! Loving Spirit Hamster Rescue, Inc. Explore the website and find out how you can help and save the life a new little friend. Meet Lily! Lily came in with her siblings Herman and Eddie around Halloween, as tiny 4 week old babies. Her brothers found homes but Lily is still looking for her furever home! She's as sweet as she is adorable, and loves being handled and spent time with. Lily is a russian campbell's dwarf, which means she cannot have corn/fruit or other sugars (as they are prone to diabetes). Lily would make a great companion for any family looking to add a new furry family member! If you're interested in adopting Lily, you can find adoption applications on our website at lovingspiritrescue.org! Like us on facebook and spread the word!